Melbourne. A Twist at Every Turn is Visit Victoria's new interstate destination marketing campaign. It is designed to encourage interstate and New Zealand visitors to travel to Melbourne and experience its many layers - from sporting events, the arts, culinary experiences, design, live music and fashion. Launched in October 2016, the campaign is the first major interstate tourism campaign in six years, featuring local artists, musicians and iconic institutions including the Melbourne Cricket Ground, Hotel Windsor, Heartbreaker and Hosier Lane. Interstate visitors make up the largest market of visitation to Melbourne, with 7.4 million people visiting and spending $5.6 billion in the 12 months to September 2017. 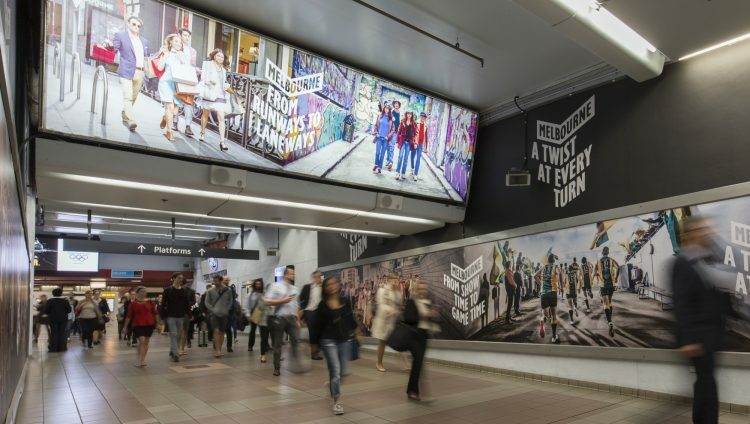 The campaign continues to be managed by dedicated team of interstate marketing specialists to boost these numbers by reminding visitors about the quality and diversity of Melbourne and its experiences through integrated marketing activities. The campaign is a fully integrated multi-channel campaign implemented across television, cinema, digital, outdoor and social media channels. Supported by the development of a bespoke interactive video allowing consumers to explore the depth and diversity of Melbourne's offerings, in addition to consumer activations and public relations activities. Underpinning the campaign is a series of commercial partnerships designed to get more interstate travellers to Melbourne, more often. As part of the new Twist at Every Turn campaign to increase interstate visitation to Melbourne, Visit Victoria created Melbourne After Dark. The experiential consumer activation transformed venues across Sydney, Brisbane and Adelaide into a typical Melbourne night out, bringing local music, art and dining experiences and the city’s 24-hour culture to life. The activation was a hit with national and local media contributing to Visit Victoria’s half yearly 2017-2018 publicity results of $22 million for the state. Previously, Tourism Victoria implemented the Play Melbourne Live campaign, the fourth and final iteration of the Play Melbourne destination marketing campaign for Melbourne, which was launched nationally in 2011. Featuring one of the latest live-streaming technology platforms, Periscope, this campaign invited target audiences globally to 'Play Melbourne live' and experience the real Melbourne in an unfiltered and authentic manner, showcasing a range of events and uniquely Melbourne experiences via a series of live video broadcasts called 'games'. The 'games' used a custom-made ball embedded with a smartphone designed to be passed around by Melburnians while streaming live footage of the city. This initiative built on the success of the innovative way in which target audiences were engaged through the delivery of the digital activation in 2013.